I hope your holiday has been great so far. The new year is just another day away. Better brush up on your new year’s resolutions! My new year’s resolution this year is to be more active in blogging about my love for stamping. I am starting today! As you know, I am a Stampin’ Up! demonstrator. I have grown my base group of fellow stampers from one monthly workshop to a second group that meets every other month. They are a great group of people and have a special place in my heart. Today, I want to share with my virtual followers the holiday card I created this year using Stampin’ Up! Festival of Trees Stamp Set from the Holiday Catalog (HC p. 24; note the bundle includes the Tree Punch). I decided to use a non-traditional green for the holiday trees on my card. The design needed to be simple in order to make multiple cards and, although it was fairly simple to put together, they turned out beautiful. The color scheme is Pear Pizzazz from the Subtles Collection and Lost Lagoon from the 2014-16 In Color Collection. Feel free to save this color scheme for future inspiration. These colors coordinate perfectly with the All is Calm Specialty Designer Series Paper from the 2014 Holiday Catalog (HC p. 22). Stampin’ Up! identifies the colors that coordinate with the DSP in both the catalog and on the packaging. This is a great idea for planning purposes – and for your future projects – taking the guesswork out of color coordination. I prefer to use Whisper White for the base of my cards when I have a “heavy” card front so that I don’t have to add another layer to the inside of the card for the sentiment. Another layer might have tipped the scale on the postage meter which is not a good thing when the mailing list is long. If you are not able to tell from the photo, the center tree is stamped and snipped separately from the others. 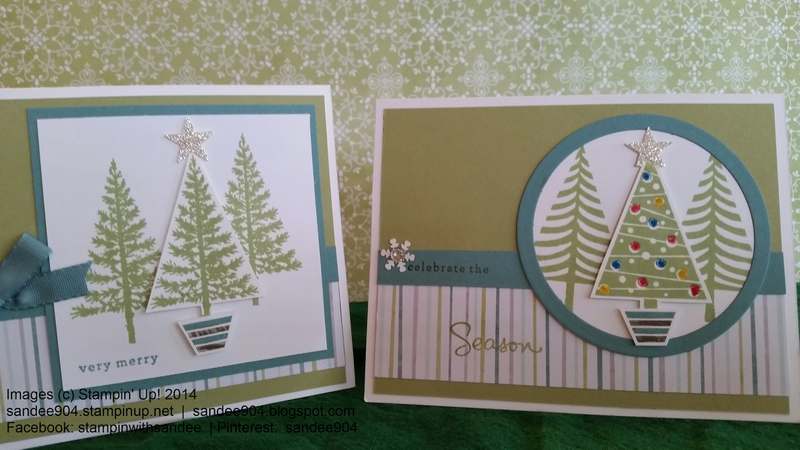 I used the Tree Punch from the Holiday Catalog (HC p. 24) to speed up the process due to the number of cards I was making, but you can stamp and snip one just as well. The individual tree is lifted up from the card with Stampin’ Dimensionals. No punch necessary for the tree stand - a couple of straight snips will do if the images are stamped side by side alternating right-side up and right-side down on a 1/2” strip of Whisper White card stock. The photopolymer stamps make lining images up so easy. Front of Card Sentiment: I tried to change up the sentiments for variety. Sometimes I stamped the sentiment directly on the main image (see the square “very merry” card), or sometimes I stamped on the strip of DSP (see the circle “celebrate the season” card). Small changes that personalized each card! So simple. Finishing touches: I alternated between a Lost Lagoon 3/8” Silky Taffeta Ribbon (HC p. 22) bow or the Frosted Sequins (HC p. 22) with a 4 mm rhinestone from the Rhinestone Basic Jewels (AC p. 209) adhered to the 1/2" strip of Lost Lagoon behind the main image. The star that tops the lead tree is punched from Silver Glimmer Paper (AC p. 193) using the Star Punch from the Itty Bitty Accents Punch Pack (AC p. 222). If you need the dimensions for the cuts, I would be happy to furnish detailed instructions. Just send me your request via email. Please remember that there is only a short time left for ordering from the Holiday Catalog, or the Clearance Rack with up to 80% discounts on retired or about to retire product – January 5 is the last day! I noticed this morning that there are only a couple of items on the backorder report so put your order in today. Do not delay another minute. As always, I would be honored if you selected me as your demonstrator on your online order. You can find the online store through my Stampin’ Up! website (URL below). Happy Holidays! And see you next year. PS: Check back on January 6th for news and updates regarding Sale-A-Bration and the release of the Occasions Catalog (formerly known as the Spring Catalog).